Introducing: The Essential Duke [RELEASE] "a bugfix / cosmetic / gameplay mod using only code"
Essential Duke is a mod that aims to make a variety of small improvements to vanilla Duke using only a single CON file. Compared with my other mods, it is light and compact, and much more faithful to the base game. To install, you simply add the included EDUKE.CON to your vanilla game folder and run the game normally. Essential Duke should work equally well in all renderers. I'm calling this a beta because it has only been tested by myself, and I may have missed some bugs or rebalancing needs. Features are listed by category below under the spoiler tags. If you aren't logged into dropbox, there is an annoying pop-up which asks you to do so, but you can just close it and do a direct download without having a dropbox account. Thank you, especially for the tripbomb option! Makes my narrow passages very deadly. Wow, it's a lot of new cool stuffs, thanks! But we need to be able to disable some of them, such as new crosshairs, steroids slow time or respawn of monsters, so as not to greatly change the gameplay. I will eventually make it easy for users to disable and perhaps modify features by category via defines at the top of the file (like in USER.CON). Modularity is useful to me as well, since I may want to use this as a base for other projects. However, this is still a beta. If everyone hates a certain feature I would rather fix it or remove it entirely than make it optional. By the way I don't know what you mean by "respawn of monsters". Realy like new Lizard's shoot and movement effects, but give them normal palette plz! Recolor is not looking good, for other monsters too! 14328 strings of new code, its a lot! Well, it's like this: I made 25% of (most types of) monsters spawn with an alternate pal and some related behavior, which in most cases is pal 17, since that one looks good in the original art (an exception is the newbeast, where I use pal 19 for the fiery version). What you have there is the HRP, which has limited compatibility with the original art. That's not my fault, and it's not something I can address in a mod that contains only a CON file. This mod tries not to break anything...but if something is already broken (e.g. things not looking right in the HRP), then I make no promises. Unfortunately, I know of no method by which my code can detect whether the HRP is being used. If I could, then I could make branches within the code as appropriate. I actually did stop myself from adding certain features that I knew would break the HRP. For example, I left all of the hud stuff alone, even though I believe improvements can be made on some of the weapon animations. Dan, I found one bug - shrinker is no effect on sharks. They not shrink. OK, I'll fix that soon. I also noticed that in polymer, the laser dot from the pistol casts a shadow (will adjust cstat to fix). I'll give it a try right now ! It is a sequel/improvement to the Darkus work? At least you've certainly taken inspiration. I known it's for "vanilla" game, but does it mean it will work with original DOS executable? It's called "EDUKE.CON", I don't think that is compatible with vanilla DOS. But you can try to rename it as GAME.CON and see what happens. Darkus' bugfix mod is a good one, and is still better in some ways for pure bug fixes, especially all the work he did to make the kill count accurate, which this mod does not do. There's a few things he did which I would not otherwise have thought of. However, the implementation is different in almost every case, and there are significant differences in which bugs are fixed and how they are addressed. Update: OP now links to version with fixes for the shark not shrinking, and the pistol's laser dot casting a shadow from polymer spotlights. The shark bug was strange. It turns out that setting shrinker damage to 1 instead of 0 made it not detect that it was hit by the shrinker at all, even though no other actor exhibits that behavior. So, that implies that both .CONs can be safely in the Eduke32 folder without causing any conflict or crash? It would be a vanilla+ then. EDIT: Nah, tried with both the .CONs in the folder and it crashed. They can't coexist at the moment. New holoduke seems good as is but I think the night vision goggles could have one more level: 0% zoom. Also, not a big fan of re-palleted tiered enemies, so if you ever come around of adding a toggle menu or something please make that an optional feature. That's basically autorun forced off for the rest of the level/game after getting armor. I'm too used to duke speed, I'd rather have less effective armor or no armor at all. But then you would have to press the goggle key 4 times to cycle all the way through. So how about 0% on first key press, moderate zoom on second key press, and then back off on 3rd key press? That's the plan, but I would like to have more specific feedback on them. My idea was to have somewhat harder enemies with different pals that appear every so often -- much like how we already have pal 21 liztroops with the cloaking device in the base game. If it's done right, then it would be a good addition. If I need to nerf them or adjust them, then I'm willing to do it. Just to confirm: did you actually play the mod and find that the running speed was too slow with armor on? The speed penalty is proportional to the amount of armor, so unless you have full armor it isn't very noticeable. Also, even at full armor you are still moving faster than Duke's normal walking speed. Having said that, I'm willing to get rid of the speed penalty -- I just want someone to confirm that it's a real problem and not merely a theoretical problem. That's what I meant, yes, the "third" option is not necessarily in that order. You've already improved the item with actual night vision but the zooming-in is a separated feature that's not intrinsically related to seeing in the dark and might actually get in the way of normal use. I was vague here because I haven't formed a opinion on the AI yet. My gripe is more about how they stand out aesthetically in a bad way, the pallete change is similar to the one used for freezed enemies and the colors on the sprites are reduced in complexity to a more uniform blue. I did play the mod, the thing is, even if the reduction is not very big, it at least feels that way after being used to the normal speed (coincidentally before this release I had just replayed one of the episodes so the game was fresh on my head/reflexes), and I don't think the trade off is necessary because Duke 3D is already an easy game as is (that of course is a subjective opinion, and since you're tweaking the AI this also might change a bit). Hmm, I see. Pal 17 is mostly purple with some of the original colors present, unlike pal 1 which is the uniform blue swap, but I do know what you mean. I'll try some others when I get home. The liztroop and pigcops each have blue on their uniforms so I can try some of the more subtle pal changes instead (maybe pal 23?). I'll probably stick with pal 17 for enforcers and commanders, though, since there are no subtle options for them. I guess I will most likely eliminate the speed penalty, but I'm going to protest a little. 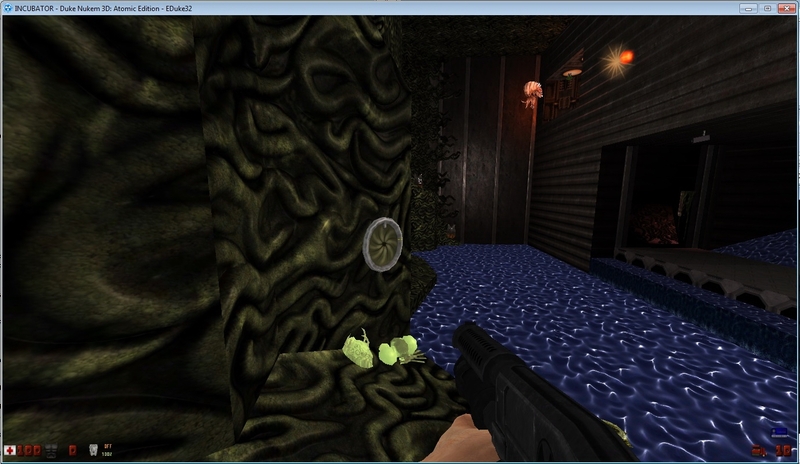 If Duke 3D seems easy, that's partly because the game has become easier. Back in '96 we played with a keyboard and it was much harder to control. We actually used the capslock key to toggle running sometimes. Nowadays, we are spoiled by perfect mouse aiming, high resolutions and framerates, while we still enjoy the advantages of auto-aim and ridiculous running speed. And yet, if someone tries to balance the game a bit -- no, no! We want all of our advantages so we can have an easy game. Played it a little! Was pretty cool and changed up the gameplay a little. I agree that the pal's are a bit extreme. Also, I think when the trooper is in the scuicide bomber state that he should only try to get you for 5 seconds or so. As multiple ones got caught up in the environment. Once on the pool table for instance. Anyways, really cool Dan! It's cool that it's all code and no new assets. Played it a little! Was pretty cool and changed up the gameplay a little. I agree that the pal's are a bit extreme. Thanks. I improved the pals, and uploaded the update right before you posted. Also, I think when the trooper is in the scuicide bomber state that he should only try to get you for 5 seconds or so. As multiple ones got caught up in the environment. Once on the pool table for instance. Anyways, really cool Dan! It's cool that it's all code and no new assets. Good point. I guess if he doesn't reach you he should finish his death animation and die normally, rather than by jetpack explosion. Cool! I'll def give it another shot! Trip report: doesn't work, doesn't even load as the game freaks out and asks for overwriting the .con file with default values. Oh well! Any chance for adding that really neat feature from DukePlus, where you could collect medpacks and they added to the portable medkit, so you could use them later? This is definitely an EDuke32 only mod. It won't even work with older builds of EDuke32 (from 2016 and earlier). Thanks for the kind words. I do not think I will be adding that medpack feature (which is in my Attrition mod as well). I'm trying to stay close to vanilla gameplay with this one; the problem with the medpack feature is it erases the distinction between portable medkits and instant health items. This makes the game easier, allowing the player to save up extra health in situations where it's not intended. I should've suggested that instead of wanting them gone and missing out on new enemy behaviour. While on this topic, since you used a red pallete for the elite fat commander and sentry drones, I believe the red colour would also fit the enforcer instead of the blue (actually I'd use the masked enforcer from the community stockpile instead of changing palletes, but I suppose you don't want to include new art). Great job on all the additions of the mod by the way, from making useless items useful to cosmetic changes like the more immersive crosshair. And yet, if someone tries to balance the game a bit -- no, no! We want all of our advantages so we can have an easy game. I don't mind a harder game (in fact, I always welcome a little more challenge, like the tweaked enemy behaviour in Brutal Doom) I just don't want a slower game (but I admit I might be nitpicking on that). Hi Dan, I continue to testing your mod, and here are some little bugs. Green buttons is pressed well with Easybutton script, but the green buttons are not pressed at all, pressing becomes impossible. First door at E1L1 is not opened by kicking. You can press F12 to take screenshots. Oops, I had failed to consider that my easy button hack only works on buttons that you can shoot! I have changed the code now so it only applies to the different types of dip switches. The download in the OP has already been updated. As for kicking doors, there are some that it doesn't work on. Diagnosing that and fixing it would wait a while longer.